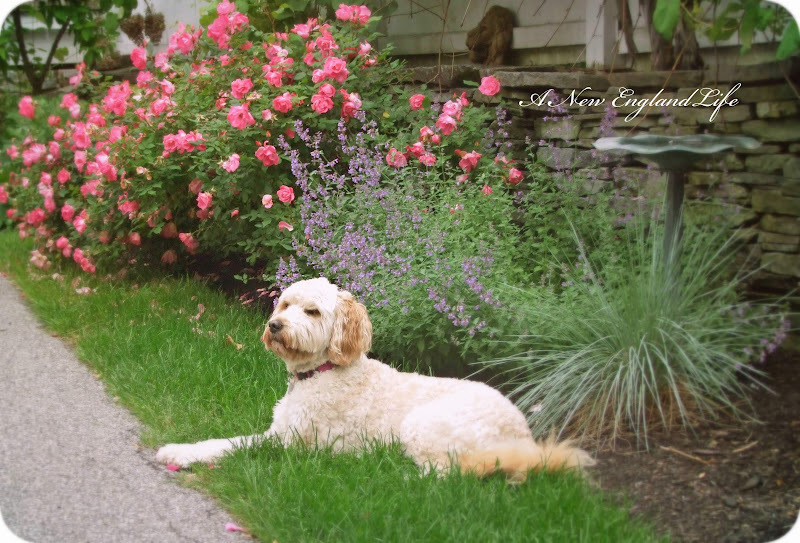 A New England Life: Divine pink! I keep trying to photograph roses, though I can't say I've shot nearly enough. We only have 4 rose bushes of our own but my husband seems to think that should cover us. Me, not so much. I want more! The following images were taken in early June at a friends home. She has the most lovely gardens. And this is the family dog, Daisy. One of the sweetest, silliest Golden doodles you would ever want to meet. She looks lovely resting in front of the roses. Like most of the country we're headed for a heat wave in the next few days. After all the rain the northeast has experienced a little sunshine is much appreciated. At this point it's looking like I may end up replanting my window boxes, as all the flowers appear to be in need of some critical care, in an area where they won't be visible to general public. And to think a little more than week ago they were so glorious. I love your photos of the roses, Sharon. Lovely perspective on the first shot, too. And what a sweet pooch! Just so lovely! Your photos are great! Hope you have a wonderful Friday and weekend! I'm sure those window boxes will be fabulous again soon!! Thanks for sharing those beautiful roses! I love roses, but never had any luck growing them. My plants in my courtyard are starting to really look sad. The heat and lack of rain (even tho I water) is really taking its toll. Enjoy your weekend and stay cool. Beautiful, as always, Sharon. The fence is perfect with the pink. And I'm with you – more rose bushes! I'm heading out tomorrow for more. Have a lovely weekend and stay safe and cool as you can. really pretty... I love those white fences, the pink roses are the icing on the cake. Daisy absolutely looks so sweet. Pink roses are my favorite color rose. The photo of the white picket fence with the lovely petals on the ground is picture perfect. There's nothing prettier than pink roses hanging over a white fence! Beautiful shot with all the petals on the ground too! I like your gardner friend's dog's name too! She looks like a sweet pooch! The first shot is my favorite! Beautiful! 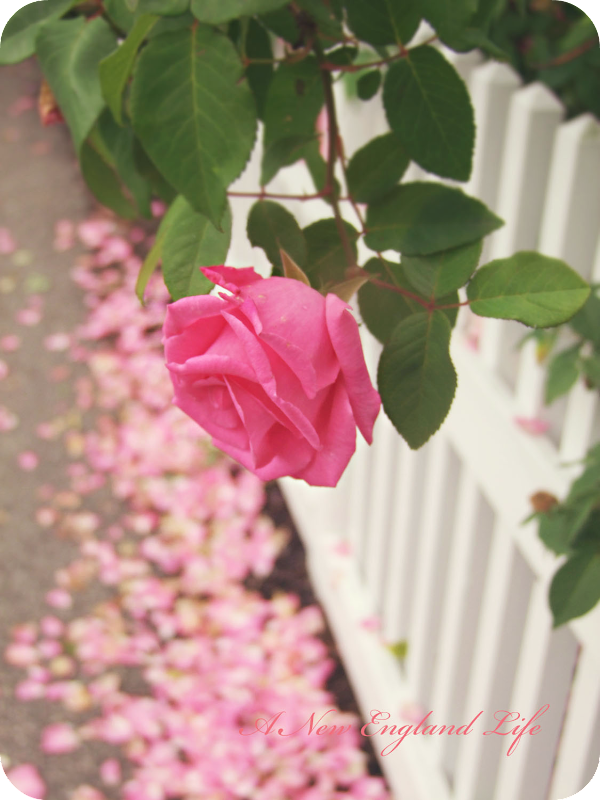 What beautiful images with the pink roses, white fence, and pink petals on the ground! Just stunning! Pink roses - the most perfect flower and color! Throw a dog in the picture and it doesn't get any better (well, maybe if a cat was in there too)! I'm not much on roses, but that second image is so incredibly beautiful!!!!!!! 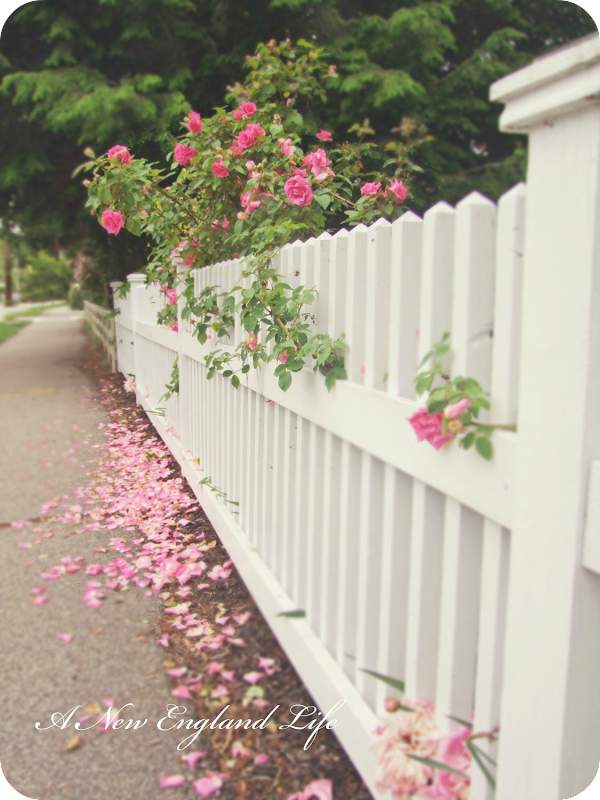 That white picket fence you got is just resplendent with so much tranquility and perfection. You won't get that with temporary fence hire around.